Need an easy dessert idea for a potluck or holiday party? 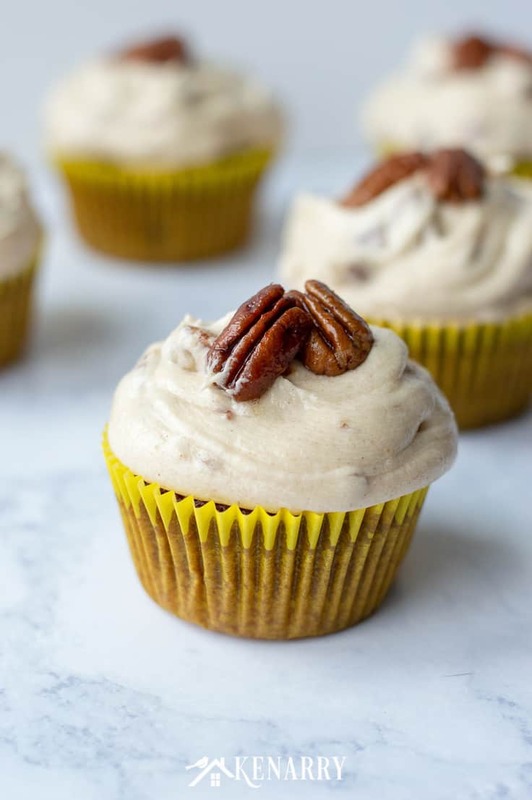 These Easy Vegan Chocolate Cupcakes with Pecan Pie Frosting are sure to be a crowd-pleaser. Get ready to bake for your vegan family and friends this holiday season without needing any special ingredients. Today we’ll show you how to make the most decadent and easy vegan chocolate cupcakes from scratch with typical foods you’d find in almost any kitchen. 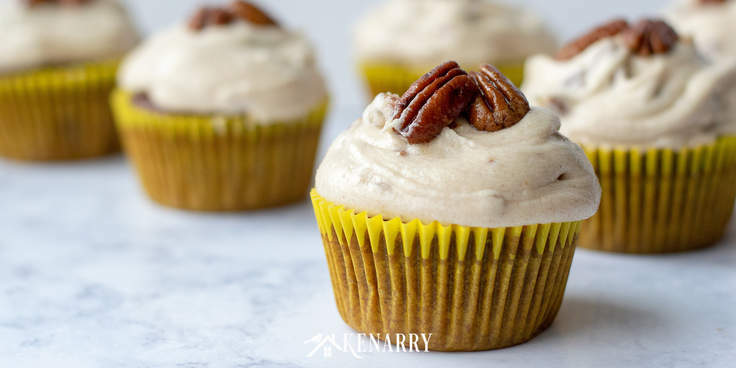 Then finish them off with a delicious homemade vegan frosting topped with candied pecans. If you or your loved ones follow a vegan diet, you know it can be difficult to find delicious vegan recipes that are also easy to make. Vegan baking often calls for nut milk, coconut cream or other vegan ingredients that you may not readily keep on hand. 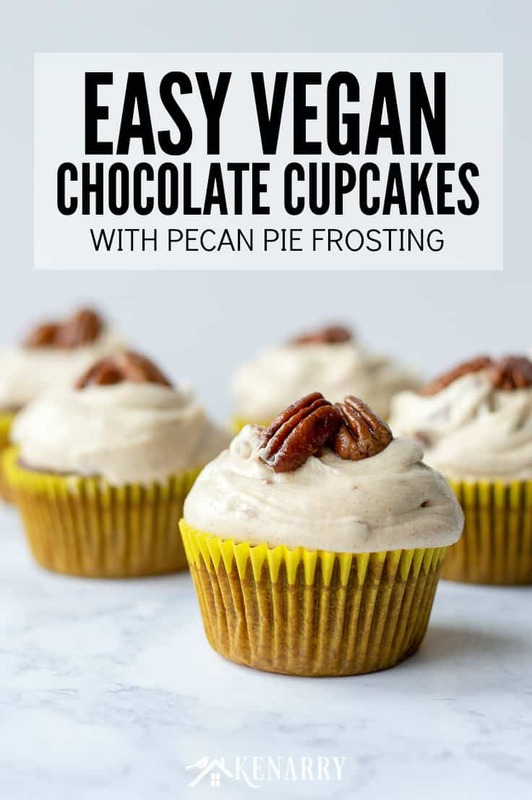 The best part about this recipe for easy vegan chocolate cupcakes from Meaghan at Cook. Craft. Love. is you don’t need any of those special ingredients! Meaghan first became interested in vegan baking after one of her best friends became vegan a few years ago. She loves to create new recipes her friend can enjoy like the cupcakes she made for her friend’s birthday or these simple one bowl vegan brownies. Yet since Meaghan herself isn’t vegan she enjoys the challenge of finding ways to make amazing and easy desserts that don’t require running to the store to find specialty items. There’s a recipe card at the end of this post for your convenience as well. It neatly combines all three parts into one simple card in case you want to print out the instructions to save for later. These homemade vegan chocolate cupcakes are decadent and delicious. 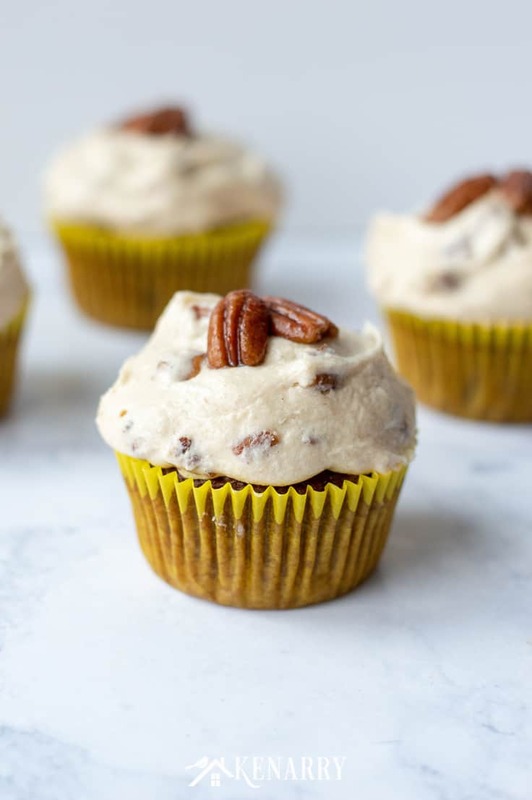 Top them with the pecan pie frosting recipe we’ve provided or your favorite vegan icing. 1. Prepare the dry ingredients. First, start by preheating your oven to 350 degrees. Now whisk together the flour, sugar, baking powder, salt, and cocoa powder in a large mixing bowl. Set the bowl of dry cupcake ingredients aside. 2. Add the wet ingredients. In a separate bowl, whisk together the vanilla, vinegar, vegetable oil, and water. 3. Combine the wet and dry ingredients. Next, make a well in the center of your dry ingredients and pour in the wet ingredients. Now whisk the ingredients together just until they’re combined. 4. Fill and bake the vegan chocolate cupcakes. Fill a lined muffin tin 3/4 full of vegan chocolate cupcake batter using a large ice cream scoop. 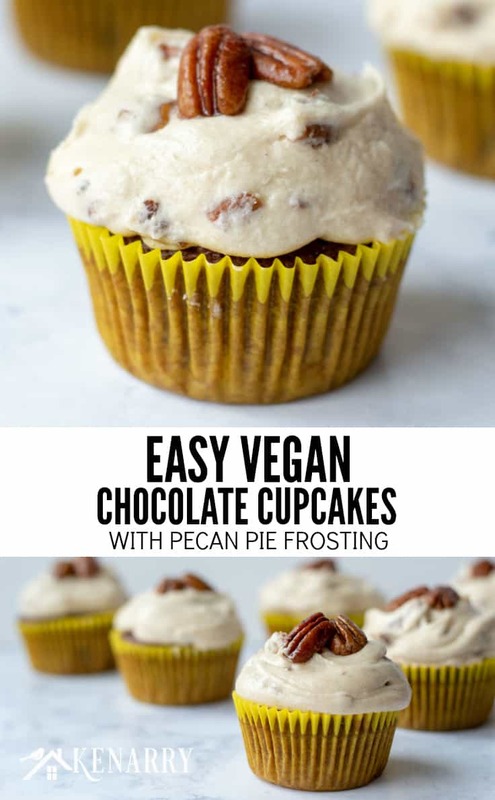 Once the muffin tin is filled, bake the vegan chocolate cupcakes at 350 degrees for 22-24 minutes or until a toothpick inserted in the center of one of the cupcakes comes out clean. Finally make sure you cool the vegan chocolate cupcakes completely before frosting. 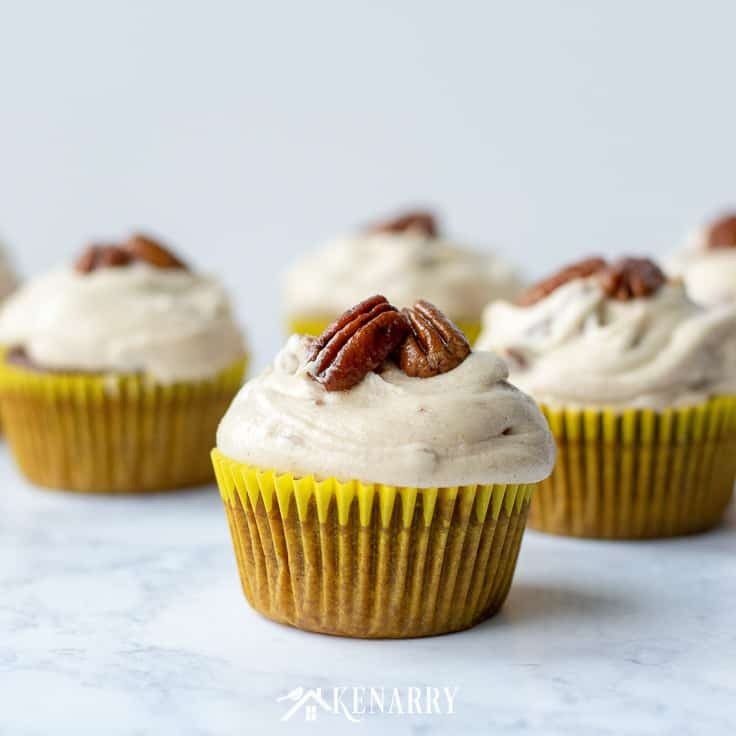 Use these simple steps to create candied pecans to use in the pecan pie frosting and to garnish the vegan chocolate cupcakes. 1. Melt butter then add sugars and cinnamon. In a microwave safe bowl melt the vegan butter. Then stir in the brown sugar, white sugar, and cinnamon. Mix the butter, sugars and cinnamon until they’re combined. Pour the chopped pecans into the vegan butter mixture and stir to coat. If you left some pecans whole for garnish, go ahead and mix those into the butter too. 3. Let the candied pecans set. Turn the coated pecans onto a sheet of wax paper, separating them slightly. Leave the candied pecans to set while the vegan chocolate cupcakes are cooling. 1. Combine vegan butter, brown sugar and vanilla. Using a stand mixer or hand mixer beat the salted vegan butter in a mixing bowl until it’s pale and fluffy. Meaghan says this should take about 5 minutes. Now add in the brown sugar and vanilla and beat until it’s well combined. 2. Mix in the powdered sugar. Add the powdered sugar, 1/2 a cup at a time, beating well after each addition. Continue to do so until your vegan frosting reaches a thick pipeable consistency. 3. Add candied nuts to make pecan pie frosting. Now take the chopped pecans that you candied and set aside earlier. Mix the nuts into the frosting just enough to combine them. 4. Frost the vegan chocolate cupcakes. Now the moment you’ve been waiting for! 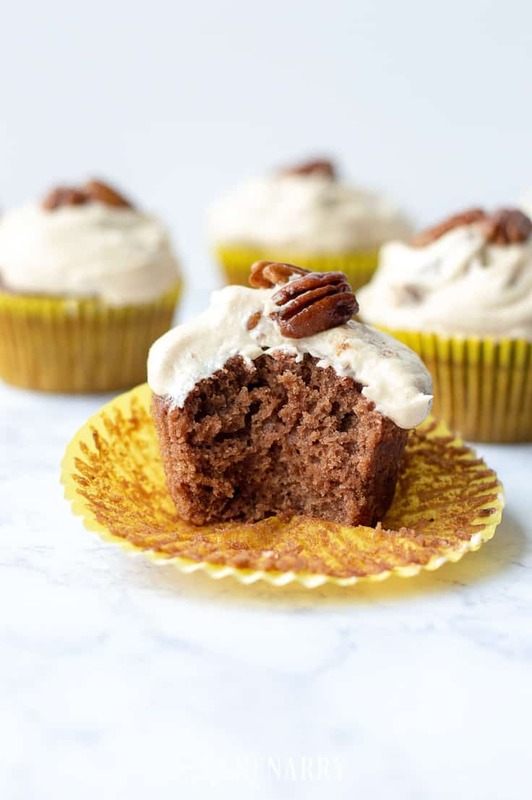 Using a decorating bag and piping tip or an icing spatula, frost each of the vegan chocolate cupcakes with the pecan pie frosting. 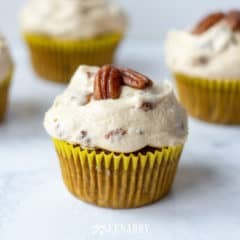 Garnish the cupcakes with two whole candied pecans, if desired. Serve with a tall glass of milk and enjoy! In a microwave safe bowl melt the vegan butter and then stir in the brown sugar, white sugar, and cinnamon, mixing until combined. Add the chopped pecans and stir to coat. Leave some pecans whole for garnish if desired. Turn the coated pecans out onto a sheet of wax paper and leave to set while you make and cool the cupcakes. Whisk together the flour, sugar, baking powder, salt, and cocoa powder and set aside. In a separate bowl whisk together the vanilla, vinegar, vegetable oil, and water. Make a well in the center of your dry ingredients and pour in the wet ingredients, whisking until just combined. Fill a lined muffin tin 3/4 full and bake at 350 degrees for 22-24 minutes or until a toothpick inserted in the center comes out clean. In a stand mixer beat vegan butter until pale and fluffy, about 5 minutes. Add in the brown sugar and vanilla and beat until well combined. Add the powdered sugar, 1/2 a cup at a time, beating well after each addition, until frosting reaches a pipeable consistency. Add chopped candied pecans and mix until just combined. 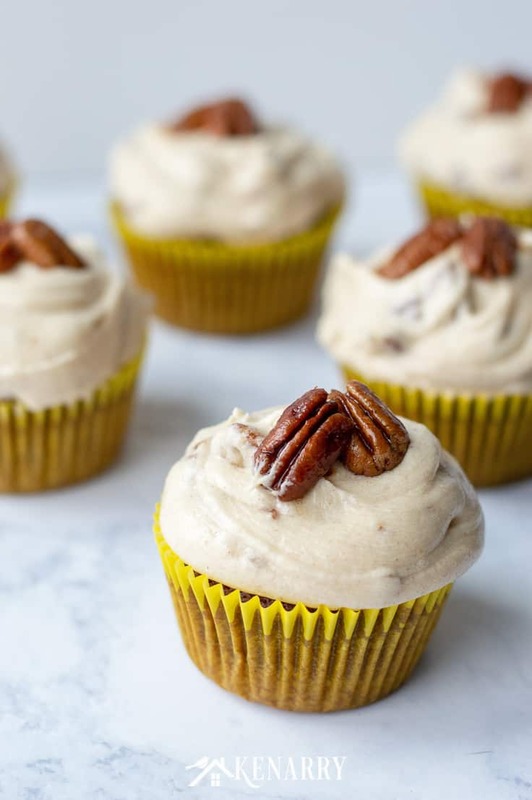 Frost cupcakes and garnish with two whole candied pecans if desired. 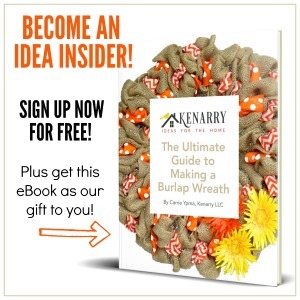 Hello Kenarry, I just went through your blog and I found it very intresting. Thank you for writing such a wonderful blog. As I follow the vegan diet from years, but now I love your recipe of making vegan chocolate cupcakes very much. Keep posting such blogs! Thanks Alyssa! Enjoy the cupcakes!